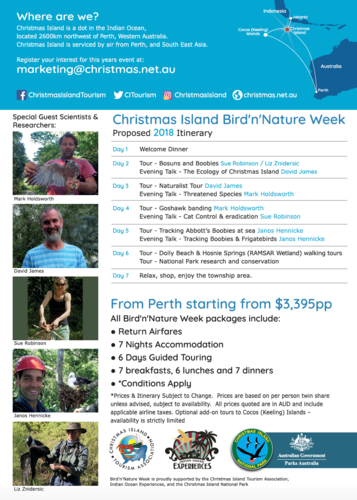 Join researchers and natural history experts in September for a week-long immersion in Christmas Island’s wildlife! A host of wildlife activities are on offer each year. 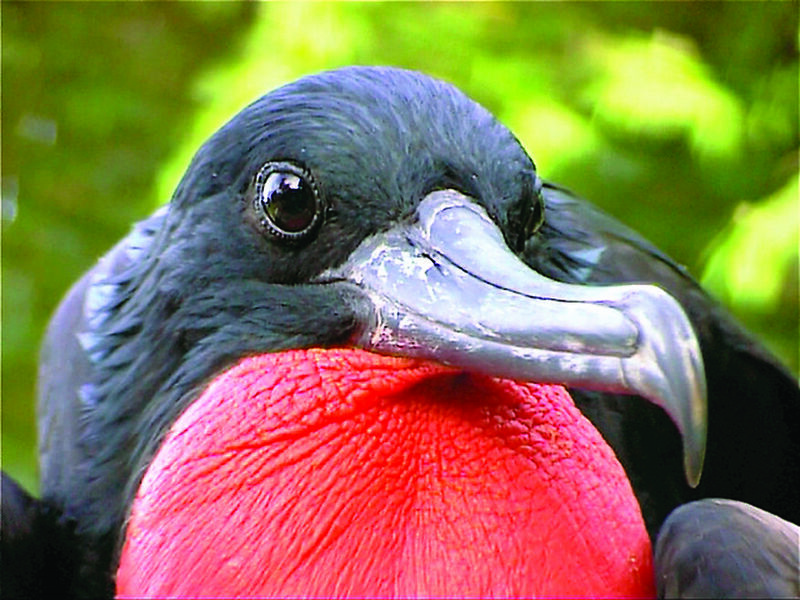 You may have an opportunity to work with guides to study the nesting biology and foraging economy of Christmas Island frigatebirds and red-tailed tropicbirds. Our perhaps you can take part in a Christmas Island hawk owl survey or map the territory of the island thrush. 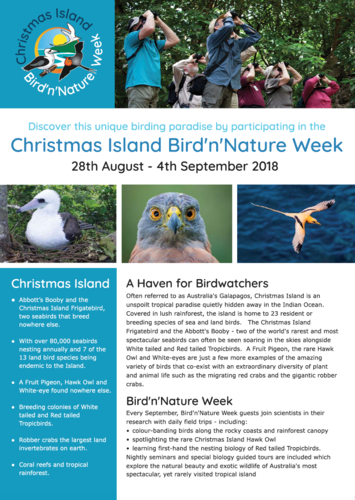 On offer are seabird identification workshops and nightly seminars showcasing seabird research, the status of the endemic landlords, and the island’s marine and terrestrial ecology. Christmas Island is one of the world’s truly spectacular tropical seabird rookeries. It’s not just the number and variety of seabirds or their magnificent splendour that make the island so remarkable, but also their sheer visibility. 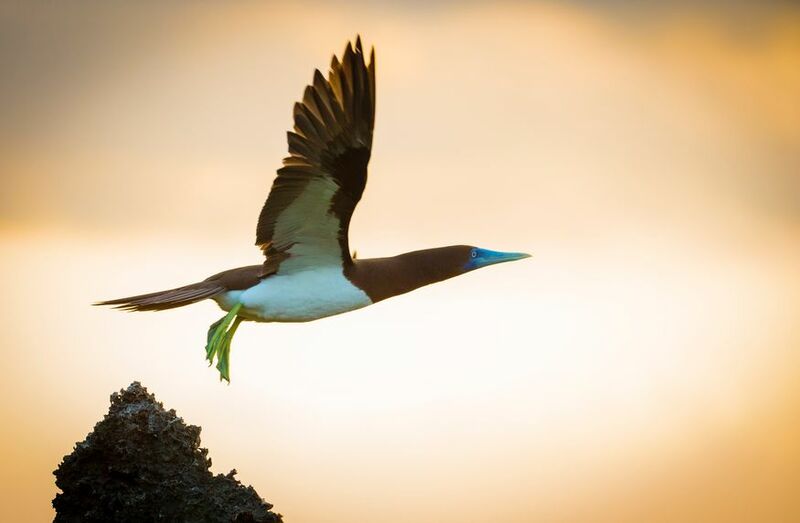 Around 80,000 seabirds nest here annually, with 23 breeding or resident species. Birds can be seen and heard everywhere on the island, at just about any time of the day. With little effort bird watchers can easily tick of a full list of residents in a busy week, or a more relaxed fortnight - although the elusive Christmas Island hawk owl keeps many coming back. More than 100 vagrant and migratory bird species have been recorded here, including eight breeding seabed species and one subspecies. 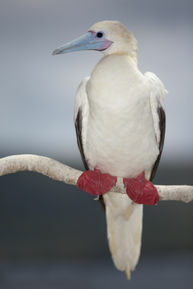 The most numerous is the wide-ranging red-footed booby, which nests in colonies in trees on many parts of the coastal shore terraces. You may see the endangered Christmas Island frigate bird soaring above Settlement - it’s the world’s rarest frigate bird and nests only on the island. 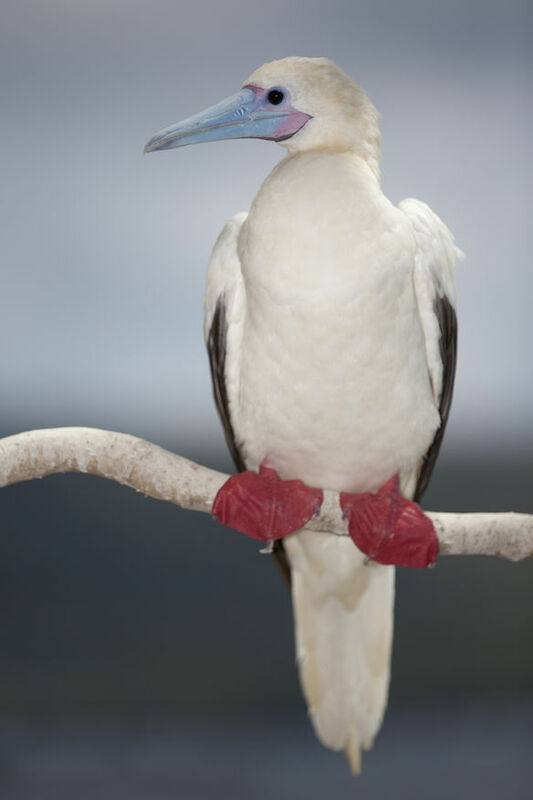 The golden form of the white-tailed tropic bird is an endemic subspecies unique to Christmas Island. Known locally as the golden bosun bird, this stunning bird is so graceful in flight. The rainforests are also alive with a variety of birds - including seven endemic species, the Christmas Island hawk owl, thrush, goshawk, emerald dove, imperial pigeon, glossy swiftlet and white eye, four of which are listed as threatened species. Listen for the inquisitive Christmas Island thrush, whole melodious evening song lends a wonderful musical quality to the tropical, palm-fringed sunsets.